Saw some old friends at the Pete Dye-abolical course and walked the front nine. Another ball-buster of a walk but I did see a few loopers jogging down the fairway. Took plenty of pics and will compile a Facebook album. Will post a link when it’s done. 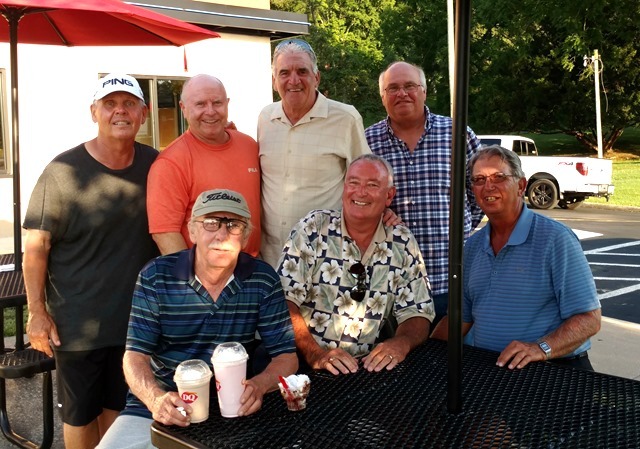 Back in the old days, it was the local saloon where all the caddies hung out but in more modern times – on the geriatric circuit – it’s the local DQ. 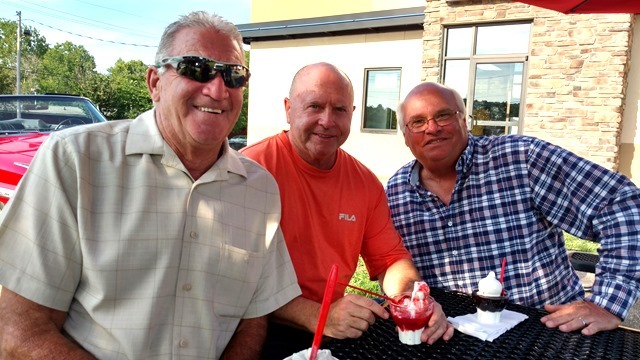 Mark Scott, Pete Smith (a geriatric wannabe 🙂 ) and Lane Kjeldsen stopped by for an ice cream treat yesterday. Chuck Berkey, Tommy Tomas and Tom Borwick showed also. We went around the table naming the first player each of us worked for when we came to Mark Scott. His was Liselotte Neumann and they’ve been together twenty-nine years! Jan Stephenson also stopped in for a dipped cone to celebrate her third consecutive Honors Division win at the Seniors LPGA Championship. Feel like I’ve shrunk down to nothing after walking those hills last week but it’s all an illusion. This entry was posted on Monday, July 10th, 2017 at 2:56 pm and is filed under Uncategorized. You can follow any responses to this entry through the RSS 2.0 feed. You can leave a response, or trackback from your own site. Hi Larry, Thanks for posting the recent pics. 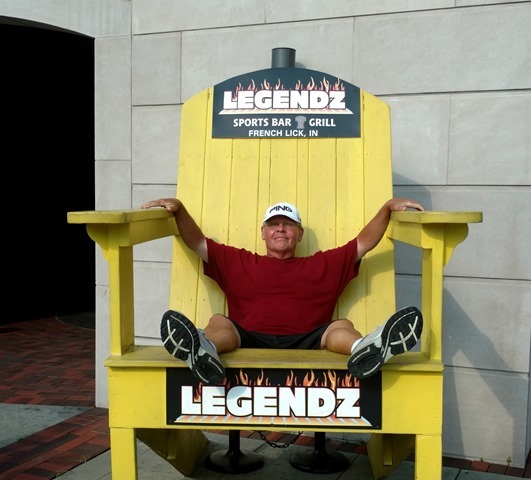 I always wondering how Lane is doing, and the picture shows he’s doing well. I guess he would be working for Kris Tchetter. Both Mark and Pete also look well, as so do you after 3 rounds of the ball buster course. If you’re still in the area, please say G’day to Lane, Mark & Pete.